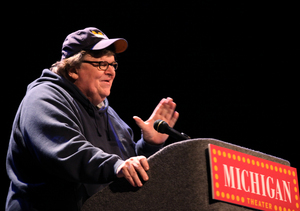 Posted on Fri, Dec 2, 2011 : 3:25 a.m.
Michael Moore spoke to a crowd of nearly 800 at the Michigan Theater Thursday night. On Thursday night, when filmmaker/author/activist Michael Moore appeared on the Michigan Theater stage to speak and read from his new memoir, “Here Comes Trouble,” he wore, and made a point of commenting on, his Michigan baseball cap. “The last couple of times I was here, I wore a Spartan hat,” explained Moore. “I was wearing it at a time when Michigan was doing really well (in football), and so just as a (nod to) the underdog in East Lansing, I’d wear the Spartan hat. But after the last 3 years here, I could not come out in a Spartan hat and do that to you. And I’m happy that you had a good fall here with a good coach who is also a good comedian. I just love the fact that he won’t call it Ohio State. Nearly 800 fans attended Moore's show, which featured the filmmaker speaking off the cuff for a little more than 90 minutes, and reading excerpts from his book for about 40 minutes. The Michigan Theater was the last stop on Moore’s 3-month book tour. Moore’s impassioned talk primarily focused on politics—specifically, the Occupy Wall Street movement—but the night began with a spotlight on Ann Arbor. Yet a significant piece of Ann Arbor bookstore lore has been lost, as Moore acknowledged. I really want to have some kind of memorial service at the location of the original Borders, because that store—and I take from your applause that you remember it—and for those of you who are students here, or new here, there was this incredible bookstore here called Borders. just to go and spend a couple of hours in Borders. And being from Flint, coming here and being exposed to books—not that we didn’t have books in Flint, but it was slim pickings—and not just the books, but the ideas in the books, and magazines from all over the world, and newspapers—it was just an exciting place to come to. Literally, we’d make a day out of it, because of this bookstore, and Borders became part of my education. It was part of my upbringing. And to come down here once a month, and go back home with a stack of books or magazines from Borders was the coolest thing. Dressed in tennis shoes, black sweat pants, and a hooded, navy blue sweatshirt—“I’m sorry I didn’t dress up,” Moore noted. “This was laundry day, and it was the last day (of the tour), and I said, aw, (expletive) it, it’s Ann Arbor, they’re not going to care”—Moore didn’t take long to get to politics. “I am here, first of all, to bring you greetings from Occupy Wall Street,” said Moore. “This is the absolute best movement in my lifetime. I’ve seen a lot of them, they’ve done a lot of good, but this one is just amazing. And it’s amazing because of the nature of it. The thing that a lot of people have been critical about—well, it doesn’t have any organization, and who’s the leader? And who’s the spokesperson? they very politely have just gone about doing this themselves, and are not using a structure that is the old way of doing it, but a structure that’s not vertical, it’s horizontal, it’s inclusive, it allows all voices. There’s no one leader because everybody is a leader. During Moore’s book tour, he visited Occupy protests all over the country—from Nevada City to Fayetteville, Arkansas to Niles, Michigan. But Moore also noted that his Ann Arbor stop fell on Rosa Parks Day, and he told the story of what had happened to him on this civil rights anniversary 10 years earlier. Shortly after 9/11, HarperCollins was scheduled to release his book, “Stupid White Men”; given the shock waves then rippling across the country, the Rupert Murdoch-owned publisher wished to delay the book’s release, which Moore readily agreed to. But as more and more time passed, HarperCollins ultimately decided to pulp the 50,000 copies already printed and ask Moore to rewrite the book with a toned-down critique of George W. Bush. Though Moore needed the money, and was struggling to pay for his apartment in New York at the time, he said he couldn’t make such revisions, and that seemed to be that. The next day, Rosa Parks Day, Moore was scheduled to speak at a labor conference at Rutgers University. Dejected, he explained to the crowd what had happened the night before, and told them he’d like to read a few chapters from the book for them, since no one would get the chance to read it. “Unbeknownst to me, along the back wall, stood a short woman of around 50 years old, and she was a librarian at a public library in Edgewood, New Jersey,” said Moore. “She went home and got on the librarian listserv, and sent an e-mail out to librarians all across the country, telling them what she had just heard: that HarperCollins and Rupert Murdoch were pulping 50,000 copies of Michael Moore’s book, and no one was going to get to read this. I didn’t know any of this was going on. For Moore, apropos of Rosa Parks Day, the experience demonstrated once again the power that an individual has to spark change. Later in the talk, Moore expressed a sense of disappointment in President Obama’s term; but he also discussed the excitement surrounding the campaign and election day. “I left the voting booth and I asked my wife, ‘Did you see his name?’ She said, ‘Yes, I just voted for him, of course I saw his name.’ And I said, ‘No, did you see his name? He put his whole name on the ballot: Barack Hussein Obama.’ He must have had a thousand consultants saying, don’t put Hussein on the ballot. So why did he do it? During a somber moment, after Moore reluctantly suggested that Wall Street doesn’t currently have a Republican nominee in the race because it’s contributing heavily to Obama’s campaign, and thus he won’t get in its way, an audience member quipped, “Well, that was worth 10 bucks.” Moore immediately pulled some cash from his pocket and gave the patron a refund. The night ended with Moore reading 3 excerpts from his memoir—but instead of continuing to stand at a podium, he moved to a nearby armchair and asked the audience to provide traveling music for him. Because he’d argued earlier that right wing broadcasters wouldn’t be angry, but would instead always be singing “Zip a Dee Doo Dah” if they were working in a country that was majority conservative, a small group in the audience started singing that song. It spread across the crowd as Moore happily made his way across the stage, toward the chair where he’d earlier tossed his hooded sweatshirt. To all appearances, Moore felt wholly at home. Sat, Dec 3, 2011 : 7:38 p.m. Sat, Dec 3, 2011 : 3:46 p.m. I knew the evening was going to be great when the BOYCOTT ISRAEL, BOYCOTT APARTHEID group held up posters before the show. Michael talked about Rosa Parks, discrimination against African Americans, corporate greed, Occupy Wall street and how one person can make a difference in the fight for human rights. The BOYCOTT ISRAEL addition was timely and oh so perfect. Sat, Dec 3, 2011 : 1:27 a.m. The comments criticizing MM for making successful films seem naive. If people make money, it doesn't mean they can't criticize the ill got gain by corporations that take advantage if the poor, the working class, the middle class. If critics don't appreciate his point of view or causes, they don't have to agree with him, but they don't have to attack capitalism itself. MM shows some of the flaws, but he doesn't reject capitalism, just its abusers, cheaters, and tax evaders. Sat, Dec 3, 2011 : 1:52 a.m. He abuses the system by making more than we do and not giving enough of it away. Fri, Dec 2, 2011 : 10:59 p.m.
Michael Moore did not grow up in Flint. He grew up in Davison, which is 10 miles east of Flint. Sat, Dec 3, 2011 : 1:26 a.m.
Ah you beat me to it! Anyone who's been there knows the difference. It's like being born in Detroit, and being raised in Bloomfield Hills - big difference! Fri, Dec 2, 2011 : 9 p.m.
Michael Moore is one of the most pathetic people in our land. He denounces captalism every chance he gets, yet capitalism is what made him rich. Capitalism is making goods and creating services that people want to buy. The transaction of selling goods and services enriches the producer with money, and the consumer with a product or service he or she values. The best part of capitalism is that one can produce a better product or service and enrich both the new producer and the new consumer. Society benefits from this. The man makes movies, writes books, charges people to hear him speak. He is enriched from these activities and those that pay the money are enriched. My friends, that's capitalism at its finest, and the hypocrite attacks it at every turn. It's deplorable. Warren Buffet is a much more reasonable liberal. Michael Moore is a hypocrite. Fri, Dec 2, 2011 : 8:34 p.m. It's a shame that Michael Moore isn't only spending his money entirely on himself, keeping a low profile, and living entirely without giving back to the community. If he was, he'd be a conservative republican and everyone who currently despises him would have decreed him a saint. I respect that he speaks with reason, researches his causes, and keeps his tongue firmly in cheek when dealing iwth the absurd. That's more than you can say for Fox News and its audience. Fri, Dec 2, 2011 : 8:19 p.m. When Herman Cain came to town Ann Arbor .com provided us with a video of Cain's talk in Ypsi.. For those of us who could not attend Moore's talk last night, we wish ann arbor com would have provided us with a chance to hear what he had to say.. . Why.? Being that Moore is not a womanizer , why Not.. . Likely he has a higher recognition rate than does Cain..
Fri, Dec 2, 2011 : 5:49 p.m.
Fri, Dec 2, 2011 : 6:55 p.m. The &quot;moronic left&quot; isn't going anywhere. You can leave, though. Fri, Dec 2, 2011 : 6:40 p.m. I disagree. There are fair criticisms of Moore's work but he's done a lot to raise awareness of wealth inequality and other injustices. And he's usually done so with a great sense of humor, much of it self-deprecating. Fri, Dec 2, 2011 : 4:15 p.m. Doesn't Rupert Murdoch actually own annarbor.com? Follow the money. And he did suggest &quot; that Wall Street doesn't currently have a Republican nominee in the race because it's contributing heavily to Obama's campaign, and thus he won't get in its way&quot;. But he also say that Obama has received more money than all of the Republican candidates combined. My question is, does he have a candidate in this race then? I was also disappointed that he said nothing about getting rid of the Federal Reserve, which we all know is a private entity and tells the Government what to do. Fri, Dec 2, 2011 : 4:21 p.m. I was wrong, it's owned by Advance Publications, owned by The Newhouse Family. Advance Publications, Inc., is an American media company owned by the descendants of S.I. Newhouse Sr., Donald Newhouse and S.I. Newhouse, Jr.
Fri, Dec 2, 2011 : 3:40 p.m. I'm glad this story was placed under Entertainment, 'cause it sure isn't reliable, intelligent political commentary. Fri, Dec 2, 2011 : 3:19 p.m.
Is it just me or, does anyone else think that the his comment about &quot; When we were kids in Flint, … we would drive an hour … just to go and spend a couple of hours in Borders.&quot; is really a bunch of BS. Don't patronize me. And go get a haircut. The whole ball cap and sweat thing is really kind of disgusting. Sat, Dec 3, 2011 : 12:13 p.m. If you've ever been to Flint, you would understand- it's not as far fetched as you think. Fri, Dec 2, 2011 : 3:15 p.m.
Hey Barb great point! Small-minded people that more than likely made the BIG JUMP up to a double-wide feel EVERYONE should live in squalor as well!! Who cares if he has a nice house? Bottom-line is that he still sticks up for the little guy. Always has, always will. I guess once the Fox news machine as well as multiple years of Rush Limbaugh contamination have tainted someone, there is no going back. Fri, Dec 2, 2011 : 3:09 p.m.
Of course Moore owns an expensive home. He's a successful filmmaker. It's called &quot;the way America works&quot;. Anyone heard of capitalism? The difference is that he actually does things with his money other than try to protect it from taxes like many others in the 1%. You don't have to be part of the 99% to know what's happening in this country is wrong for most of the people in it. Fri, Dec 2, 2011 : 3:06 p.m. I love how when Michael Moore comes to town the right-wingers come out of the closet in droves to attempt to criticize him.. He made GREAT points last night about how Big Business is running scared since the Occupy Wall Street folks have been questioning the determined, constant SCREWING of the 99%ers for YEARS!! American lemmings have been brainwashed for YEARS thinking that they too can be rich and part of the 1% when in reality very few make it that far but yet they still defend the Bush Tax cuts and ANY additional taxes on the rich is a bad idea. People that watch Sicko, Bowling for Columbine, Capitalism- A love Story, etc. and not walk away disgusted with the general mis-treatment of the poor and middle class have to be living on cloud nine! All Mr. Moore does is bring to light issues that Big Business and the government don't want you to think about so you can get back to paying taxes for things that don't benefit you.. Wars, etc. GO MICHAEL!! GIVE EM HELL!!! Fri, Dec 2, 2011 : 4:07 p.m. I don't have a horse in this race. I was there last night because we ushered But Dave, you just lost me on this comment...&quot;Small-minded people that more than likely made the BIG JUMP up to a double-wide feel EVERYONE should live in squalor as well!! &quot;. Nasty. Fri, Dec 2, 2011 : 2:38 p.m.
With all of the Rick Snyder and Randy Richardville attacks on the poor and middle class in Michigan, Michael Moore's visit gave me and many others HOPE that we might have a chance to survive the Snyder and Richardville's &quot;Race to the Bottom&quot;. I seriously doubt that Moore owns a multi-million dollar home like does Snyder in his &quot;gated&quot; community in Superior Township. All that I talked with in attendance hoped that Moore will become a member of the 1% because he would get there by defending the 99%. Stories about Rosa Parks and the Librarian pointed out that &quot;one&quot; person can make a difference in our struggle against the Snyders and Richardvilles of our state. Michael Moore, however, was critical of the 99% by saying that we allow the conservatives to beat up on us. We don't fight back. Thus a hint as to our future way of dealing with our attackers. Fri, Dec 2, 2011 : 2:10 p.m. I respect Rosa Parks and all that she did, but has there really been a &quot;Rosa Parks Day&quot; holiday for ten years? I've never had children come home with projects or anything to acknowledge or celebrate it, i get mail, what exactly is it? And before I get flamed, I have nothing against Rosa Parks or her having a &quot;Day&quot;, I've just never heard of it, and I've certainly never heard anyone use the phrase &quot;the next day, Rosa Parks Day&quot;, etc... And I admit, I skimmed the article, is Moore part of the Buffett/Gates &quot;we want to pay more taxes&quot; crowd? Fri, Dec 2, 2011 : 5:14 p.m.
What I meant was that he didn't outright state, in the context of last night's talk, that he was willing to pay significantly more in taxes, though the views he voiced would certainly imply that to be the case. Fri, Dec 2, 2011 : 2:56 p.m.
Moore said the top should pay at least what the rest pay..he did talk about it. Fri, Dec 2, 2011 : 2:25 p.m.
Actually, it's the anniversary of the day when Rosa Parks refused to give up her seat on the bus - so maybe &quot;holiday&quot; isn't quite the right word. I'll clarify the wording on this in the article. Thanks for raising the question. As for your second question, Moore didn't address that specifically. Fri, Dec 2, 2011 : 2:05 p.m. This is the kind of negative stuff from the &quot;respected journalist&quot; Andrew Breitbart and &quot;fair and balanced Fox News&quot; have to say about Michael Moore... he's fat, he's rich, he wears his hat indoors, he has a big home. They say these things because they don't have anything to refute his facts. Mike Moore is as genuine and authentic as they come. His message has been consistent since his first film. No flip flopping, no pandering for money or power (he already has it) and The Right hates him for that becasue it's the complete opposite of what they are. Sat, Dec 3, 2011 : 5:20 a.m.
&quot;he's fat, he's rich, he wears his hat indoors, he has a big home.&quot; All of which are true statements. Thanks for proving that Brietbart and Fox News are factually accurate. Fri, Dec 2, 2011 : 1:58 p.m.
Michael Moore is a subversive genius and it's obvious that the Right fears him because not only does he speak truth to power he has the money to back it up. Sat, Dec 3, 2011 : 5:19 a.m. The right doesn't fear him. Mock and laugh, yes, but fear, no. Well, maybe at a buffet we would fear him. Fri, Dec 2, 2011 : 1:55 p.m. Sat, Dec 3, 2011 : 12:41 p.m.
Ouch. It's raining cold hard facts up in here. Fri, Dec 2, 2011 : 9:04 p.m. The downstairs had plenty of seats available behind the soundboard. I was back there. Fri, Dec 2, 2011 : 2:51 p.m. I can't speak to that. Maybe there were seats in the balcony open. The downstairs was very, very full. It was festive and lively. Fri, Dec 2, 2011 : 1:44 p.m. I'll venture a guess that those who believe Michael Moore can't crusade for the less fortunate because he has money, are the same folks who think global warming isn't factual because it's cold outside. Fri, Dec 2, 2011 : 1:33 p.m. The theater was jam-packed. I had a hard time finding a seat. And just because you do not agree with him, does not mean those of us who do are &quot;blindly following&quot; anything. He spoke thoughts and ideas that have been my own for a long, long time. I agree with him. I don't follow him. Fri, Dec 2, 2011 : 3:41 p.m.
Nope, I ushered the event. Not jam packed. Plenty of seats. Fri, Dec 2, 2011 : 1:19 p.m.
Fri, Dec 2, 2011 : 6:36 p.m. So an author drew only 800 pay customers to hear a talk on his book tour? Perhaps you're completely unfamiliar with book tours but most authors are glad to have 20 people at a bookstore - with no charge. Moore draws 800 to a large auditorium and you think it's a failure? LOL indeed. Fri, Dec 2, 2011 : 4:49 p.m.
@ &quot;Smart&quot; Logic: If you actually read my post you'll see that I wasn't applauding anything nor lauding any possible &quot;contributions.&quot; Nor did I ever say anything about my &quot;hate&quot; for the 1%. In fact, I never even alluded to that, ahem, discussion. My only point is that warranting your argument against a figure because of the house he lives in seems to be a bit of a stretch. Fri, Dec 2, 2011 : 4:39 p.m.
cgerben, so, where's the break on all of this? All of the 1% are apparently doing the same, right? Hiring people to build huge houses, paying taxes, and so on. You can't hate on all the 1% but then applaud left wing Michael Moore's &quot;contributions&quot; to society. Fri, Dec 2, 2011 : 4:09 p.m.
First of all, Breitbart is your cited source? There goes all of your credibility in one mere hyperlink. Second, how many contractors, builders, tradesmen, and overall Northern Michigan citizens do you think it took to build that house? How many thousands of dollars do you think he pays in taxes for that property? A sign of a hypocrite is that no matter what evidence is displayed he'll spin it to serve his (repurposed) main points. In this case, I can only imagine the uproar if Moore lived in California or New York. As it is, he keeps his money in Michigan, has pumped literally millions of dollars into the TC area through his work with the film festival, and continues to support Michigan on a national scale. Say what you want about the man's views, but you can't assail the man for trying to reinvest in ways that most of us are simply unable to. Fri, Dec 2, 2011 : 1:06 p.m.
A one-percenter wants to talk about Occupy? Now that's funny. No, wait, it's hypocritical, and that's Michael Moore. The absolute best movement in his lifetime is the one that leaves 30 tons of garbage behind when they leave? It's really upsetting to see the number of people who will blindly follow this clown. Think for yourselves, people. You need some idiot like Moore to tall you what to think. &quot;Brilliant,&quot; &quot;eloquent,&quot; inspiring,&quot; ... that's really scary. Fri, Dec 2, 2011 : 2:07 p.m.
Kinda like the same words used to describe Sarah Palin, Michelle Bachmann, Rick Perry and Herman Cain? Fri, Dec 2, 2011 : 12:44 p.m.
Why does he always wear a too-small baseball cap inside? No sun or rain inside the Michigan Theater. I think it's rude and shows disrespect to his audience not to remove his cap. Fri, Dec 2, 2011 : 4:30 p.m. If this was 1911, then yes. If he was in a church, yes. But that idea is an archaic one. Fri, Dec 2, 2011 : 3:43 p.m.
a2 person...i said &quot;part&quot; and i'm stickin' to it..... while i agree with alot of his stances ( although not all) , there is undeniable &quot;shtick&quot; in what he does and how he does, including self presentation. would Fred Astaire have been Fred astaire in a wife-beater and baggy jeans? Fri, Dec 2, 2011 : 1:08 p.m. Agreed. We teach our children to show respect by removing hats indoors (well, some of us do). No big surprise this guy goes the opposite way. And what size is that sweatshirt anyway? Fri, Dec 2, 2011 : 1:02 p.m.
No it's not. I went to hear his passion, his humor, and his political thoughts, which I agree with whole-heartedly. Fri, Dec 2, 2011 : 12:52 p.m.
that persona/haberdashery is part of why he's economically in the '1%&quot; and why people came to see him. Fri, Dec 2, 2011 : 12:12 p.m. This argument that we shouldn't listen to Moore because he's rich and therefore not &quot;one of us&quot; is bewildering. It is so completely foreign that someone would speak their passions about what they believe is right and good and just, and then people are skeptical because he is NOT motivated only by self interest and greed. Sad world. Moore was brilliant last night. He was eloquent and hilarious and exactly right. He was inspirational. Best $5 I ever spent. Fri, Dec 2, 2011 : 4:37 p.m. He's subjective, and your label of inspirational is subjective as well. I find him offensive, obnoxious, and highly subjective. Fri, Dec 2, 2011 : 12:15 p.m.
Oh, and yes... $5 is what I paid as a member of the Michigan theater. It was a whopping $10 for non members. For 2 1/2 hours of awesome. Fri, Dec 2, 2011 : 11:36 a.m.
Michael Moore lives on Torch Lake in a multimillion dollar house (It is near Traverse City). How can 800 people pay to listen to him talk about himself, Wall Street, and how everyone else should live? Don't let his sweatshirt fool you. He is the 1 percent. Sat, Dec 3, 2011 : 12:04 p.m.
A common misconception among 1%-sympathizers is that Michael Moore is anti-capitalism, and anti-profit. Mr Moore, and the 99% are against Capitalism-Abuse, a.k.a- Corruption, we are able to separate the two. The sympathizers however, are so focused on accumulating money for themselves, that they can't see the proverbial forest for the trees. Fri, Dec 2, 2011 : 8:49 p.m.
Barb: you miss a very key point. The guy walks around basing capitalism, and here he gets rich from it. That's woud make him a hypocrite. You see, it's actually quite simple. If you make a product or have service that people want and are willing to pay for, and you become rich doing it - that's capitalism. The &quot;producer&quot; gets the money and the &quot;consumer&quot; gets the product or service. Both parties are enriched. He makes films people are willing to go and see. They pay their money for it. It enriches him. Good for him. But to denounce capitalism when it made you rich... It's pathetic. Fri, Dec 2, 2011 : 3:12 p.m.
Of course he's part of the 1%. He's a successful filmmaker. He's not lying about anything. And he's not telling anyone how to live but he is all for standing up and doing something when you see there's something wrong with the way your country's being run. Yeah, what a charlatan. Fri, Dec 2, 2011 : 3:04 p.m. I love knowing where he lives, what towns he goes to, that he takes a room at a hotel near the airport before the first flight in the am...that he went to the librarian's retirement party in NJ. .it's a good thing he lives on Torch Lake because there are a lot of closed storefronts in Elk Rapids....Spending his money up North and around Michigan is a great idea, just like Jeff Daniels. He's big-he needs a big house.He does a lot of good with his money. He's fat? Rich? Has a big home? Wears his ball cap indoors? And how do you feel about the 1%? The bankrollers of the Republican Party?